Replace your overheated factory intercooler with the VRSF upgraded intercooler kit to get the most out of your N54/N55. We designed this kit to be one of the best performing, direct bolt on intercoolers available for your BMW with special attention to quality and performance while maintaining a reasonable price. Our intercoolers allow for higher HP gains, mainly due to their ability to keep intake temps down while preventing heat soak which is a common problem with the factory intercooler. This results in a more power and increased reliability with reduced chances of pre-detonation & knock. We remedy this problem with our custom bar and plate core design which utilizes a staggered and offset high density internal and external fin pack. Our core has been carefully tuned to provide the the best intake temperature reduction while maintaining minimal pressure drop. Our bar & plate core is also much more durable than the OEM tube and fin core, with a better ability to withstand rocks and other debris. Our 5" core is recommended for those with goals of 300-500whp. We recommend our 7" intercooler for individuals requiring the utmost intake temperature reduction, ranging from the stock turbo setup to single turbo. Our 7" FMIC has been involved in many record breaking builds and is currently featured on the current world's highest horsepower N54 @ 861WHP. 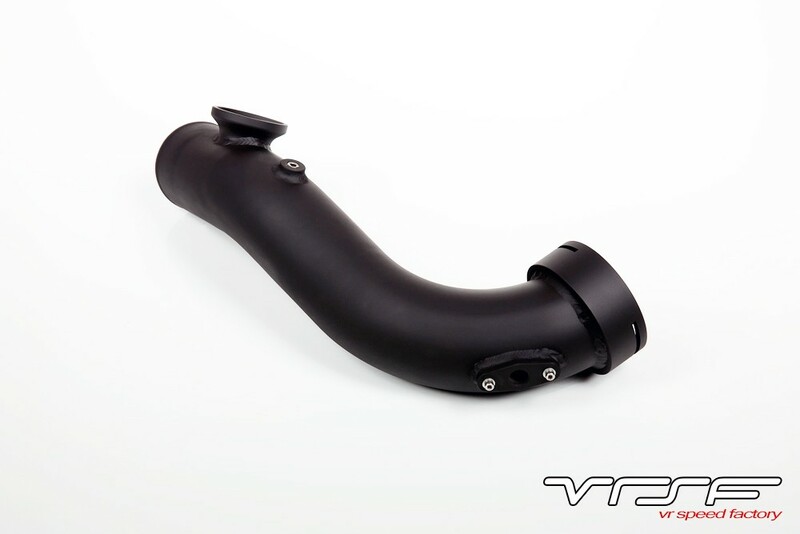 Both VRSF intercoolers feature tabs that allow the retention of the factory fan shroud. We also include additional mounting hardware for extra support. We include everything required to repalce the OEM intercooler, including custom molded couplers and stainless steel t-bolt clamps necessary for installation. Please note that Z4 & 535i models will require additional hardware to complete the install. Instructions can be found here for the 535i and here for the Z4.. The 5" stepped core unit does not require trimming of the black plastic shroud (minimal trimming may be required on some models) . The 7" requires trimming of the black plastic shroud behind the bumper. The bumper does not require trimming with either models. 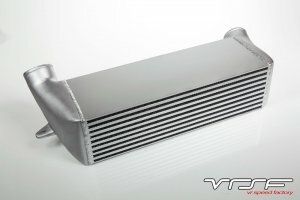 Each VRSF intercooler is hand finished and pressure tested to ensure a high quality, leak free experience. Our intercoolers fit both Left Hand Drive (LHD) & Right Hand Drive (RHD) Models as well as all XI models. Dimensions: 7" - 20x5.75x7.125" / 5" - 20x8x5"